JNN 27 Apr 2015 Kathmandu : Rescue crews and residents in Nepal early Sunday began the desperate search for survivors after a magnitude-7.8 quake near the capital of Kathmandu a day earlier flattened homes, buildings and temples, causing widespread damage across the region and killing more than 1,800 people. Whole streets and squares in the capital of more than 1 million people were covered in rubble. Stunned residents stared at temples that were once part of their daily lives and now were reduced to nothing. Locals and tourists ferreted through mounds of debris in search of survivors. Cheers rose from the piles when people were found alive — but mostly bodies turned up. The injured ended up being treated outside overflowing hospitals, where crowds of people gathered looking for relatives. Dozens of bodies were pulled from the historic nine-story Dharahara tower that came crashing down during the quake. At least 17 people were reported killed on Mount Everest, where the quake caused multiple avalanches. A seemingly endless series of aftershocks continued to roil the area, further traumatizing survivors. Residents huddled in the cold rain overnight for safety. The death toll of 1,832 is expected to rise as the full extent of the damage is assessed. The quake was the strongest in the region in more than 80 years. Residents are used to earthquakes in Nepal, and many thought the start of Saturday’s quake was a tremor, until the earth kept shaking and buildings crashed down. An estimated 4.6 million people in the region were exposed to tremors from the Nepal earthquake, the United Nations Office for the Coordination of Humanitarian Affairs said via Twitter. Thirty out of 75 Nepal districts were affected by the quake. In neighboring Tibet, roads buckled, buildings collapsed and at least 13 people were killed, China’s state media reported, citing local authorities. 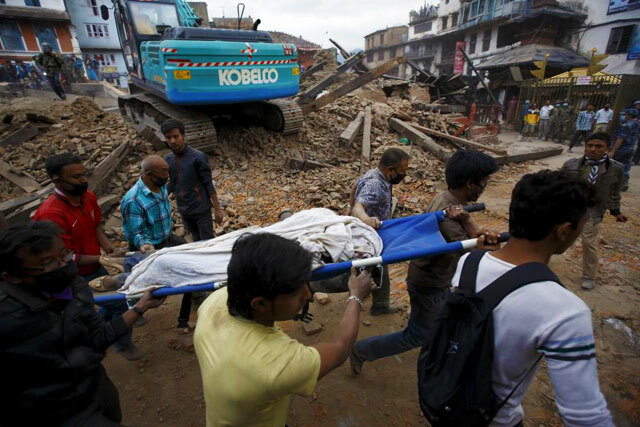 Officials in India confirmed at least 34 deaths in three states from the Nepal quake. The quake struck at 11:56 a.m. local time (2:11 a.m. ET) and was centered less than 50 miles northwest of Kathmandu. It occurred at a depth of 9.3 miles, which is considered shallow and more damaging than a deeper quake. It was reported by people in the area as having lasted a long time. One person said he felt as if he were on a ship in rough seas. Kathmandu sits in a valley surrounded by the Himalayas. Siobhan Heanue, a reporter with ABC News Australia, told CNN she was wandering at an ancient temple complex at the moment of the earthquake. Several temples collapsed around her, she said. Heanue watched as residents picked through the rubble of a destroyed temple. They found 12 bodies. The Dharahara tower, the landmark nine-story structure, was packed with people when it collapsed. Heanue said at least 50 bodies were pulled from the ruins of Dharahara. The tower, built in 1832, provided visitors with a panoramic view of the Kathmandu Valley. 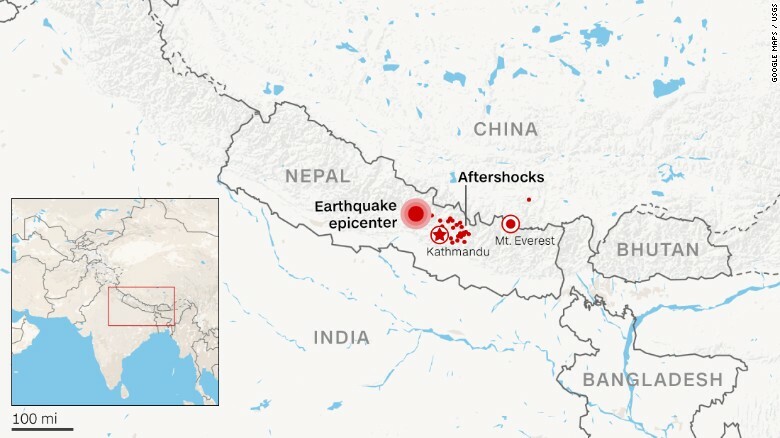 Kanak Masni, a journalist in Kathmandu, told CNN by telephone that this appeared to be “the most massive earthquake to hit central Nepal since 1934.” In that quake, which was 8.1 magnitude and centered near Mount Everest, more than 10,000 people were killed. Thomas Nybo, a freelance photographer, was sitting in a coffee shop in Kathmandu’s Thamel district. It appeared to be a minor tremor at first but gradually gained intensity, he told CNN. Thousands poured onto the streets of the densely populated tourist hub. Outside the coffee shop, Nybo said he saw a group of women gather near what had been a six-story building. One woman said children were trapped beneath rubble. Two bodies were found near the spot where the man was rescued, Nybo said. Not far away, lay the bodies of three or four women. The streets of Kathmandu were packed with thousands of locals and tourists who didn’t want to go back to their homes or hotels because of recurring aftershocks. Rob Stiles and his wife had just checked into a hotel in Kathmandu when the earthquake struck. “It felt like it went on forever,” the California resident said. Outside, people ran onto the street, with the temblor knocking some off their feet. A huge section of a brick wall crushed motorcycles and a car. Later, as they walked around the city, an aftershock hit. Denis McClean, spokesman for the U.N. Office for Disaster Risk Reduction, told CNN that weak building codes in Nepal contributed to the amount of structural damage. Chitra Thapa, 48, a CNN security guard in Atlanta, said he spoke by telephone with relatives in Kathmandu and Pokhara, a city about 125 miles (200 kilometers) west of the capital. They were fine and were staying on streets. The death toll in India has climbed to least 69, with more than 270 people injured, mostly in the northeast border state of Bihar, the Ministry of Home Affairs said. This entry was posted in Asia Pacific and tagged China, Earth Quake, india, Kathmandu, Nepal, Tibet. Bookmark the permalink.